The Oscar nominations bestowed on Babel suggest that the time is ripe for stories that remind us the world is getting smaller every day, and we're all more connected than we think. Alejandro González Iñárritu's solemn film wasn't wildly popular, but it seems to have struck a chord. FireWife, the first novel from Yale grad student and Randolph resident Tinling Choong, plucks some resonant nearby strings. It's also the debut of a talented writer who has a knack for alternating between floridly sensuous prose and plainspoken abruptness à la Jamaica Kincaid. FireWife is the story of eight women who live scattered over the globe, from Taipei to Amsterdam to New York, all of Asian ancestry. The nominal protagonist is Nin, a young architect of Chinese heritage who, much like the author, was raised in Malaysia and now lives in the U.S.
Like many - perhaps too many - young female protagonists of fiction, Nin is on a journey of self-discovery. She's sick of her job designing "E.D.I. Friday" chain restaurants for cities such as Bangkok and Singapore. So she obtains a six-month leave of absence to fly around the world shooting portraits of "nameless girls and women" for a photo essay she calls "FireWife." Nin's deeper agenda is to rediscover her own "fire" self - a self free from guilt over the role she played in her sister's accidental death decades earlier. 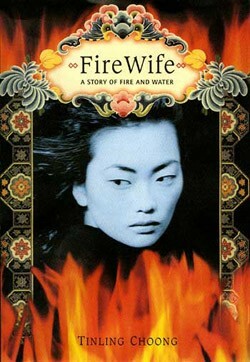 In the novel's carefully constructed symbolic scheme, based on a Chinese creation myth, "fire" represents spontaneity, boldness and sexual freedom. "Water" represents stability, continuity and the maternal virtues most cultures expect women to embody. Nin has spent most of her 31 years being "good," as daughter, wife and employee, but now she's had it with her "Water Me." "How does one leap off the solid cliff of memories and fly immensely?" she asks. "How does one become free as a fearless tiger with wings?" If this sounds like every "female self-empowerment" narrative ever written, it is - in some ways. But Choong is a complex thinker, and she shows us the other side: the dangerous heat of fire as well as the allure. The first voice to speak in the novel isn't Nin. It's the ghost of Lakshmi, a low-caste Indian woman whose "fire tiger" spirit, "fierce but blind," helped bring her to grief. In a lyrical, compressed narrative of horrors that's like a darker version of the opening of The Color Purple, Lakshmi tells her niece Parvati, whose dreams she's visiting, how she married for love and found herself in slavery. "Really, they respected cows and fish more than they did me," she says of her husband's family. "They didn't kill cows." By the end of her tale, Lakshmi has returned literally to her element - fire. But we're told that her spirit follows Nin on her travels, as the photographer encounters a series of women who have their own stories to tell. They do so in their own words, in a series of short chapters that alternate with chapters narrated by Nin while she's in transit. Like Lakshmi's, most of these stories are rife with oppression and atrocities. In Thailand, we meet a 14-year-old prostitute; in Japan, a woman who sells her naked body for use as a sushi table. In the West, women don't seem to be much better off: These narrators speak of childhood molestation, spousal abuse, bulimia. A welcome exception to the pattern is Zimi, a Taipei rock musician with a saucy voice who makes her own choices, whether she's renting out her forehead as ad space or breaking her own hymen so the virginity-obsessed doctors will let her donate eggs to an infertile friend. If Choong makes us want to read on through passages like this, it's a testament to her talent for evoking a world fractured by cultural, class and gender gaps, yet somehow still united by myth, psychobabble and pop culture. Like many young people today, Nin is equally comfortable discussing the life of Buddha and the modern myth of The Matrix. She lusts after a generic alpha male she refers to as "Russell Crowe." And when she seeks enlightenment from the divine, she finds that "God has the speaking voice of James Earl Jones and Judi Dench in one body." Some might say there's something "imperialistic" about the power of these Hollywood reference points in Nin's personal mythology. But the novel suggests that mixing it up, personally and culturally, isn't always a bad thing. "You have no sense of land," a mysterious stranger tells Nin. "You feel as though you belong to everywhere and therefore nowhere at all." Global citizen though she may be, Nin doesn't live in a Babel of miscommunication. The stories of "nameless girls and women," echoing and building on her own, root her in a tale as old as time. December 31, 1981. We were at Good-Grandma's Tapioca House in the village of Terong that afternoon because my Other-Grandma, the Godzilla, had thrown Mama's clothes from inside Kinta House onto the main street of Kinta at 12 p.m. sharp. Mian, Liang, and I were playing Lost in Space on the Kinta main street pavement at that exact moment. The last day of the year, school ended earlier than usual. All the Kinta town folks and children were home early. Like us, they saw Mama's clothes shooting into the street, propelled and sustained for an unusually long time in the noon air by the simple rage of my Other-Grandma. She was a tiger. I asked Mama once if I could change to be a rabbit like her or a dragon like Mian or a horse like Liang. Mama explained that tiger has many kinds. You can be a good one. She didn't say you are a good one. She said I can be a good one. Can Be is dangerous and can be bad. Underneath Mama's airborne clothes, I saw the neighbors' eyes piercing from the deep shadows in their living rooms through the gaps in their front doors. The eyes had teeth. Sharp ones. I saw the gaps of their front doors turn into the gaps of their front teeth, out of which gossip would self-sprout and self-feed. Mama left her clothes untouched on the main street that day. We left our chalk-drawn spaceship sitting apologetically on the sidewalk. We made a line walking down the main street heading toward Good-Grandma's Tapioca House in the next village, fifty stone-throws from Kinta House. Kinta people's eyes had teeth. They nibbled at my feet. A blind-white noon. Windless and peopleless, the street smelled faintly of smoked rubber, and stray dogs stood like amputees. Hissing crickets hissed us along. I wished we were on horses, like the cowboys with long chins in Bonanza, vanishing into the end of their Main Street, into sunset, into justice, into a happy The End. But we walked.